Our two-car convey held a party of four people, two cats, one bird and one stick insect. Nick drove Elmer towing our trailer, with two human passengers. 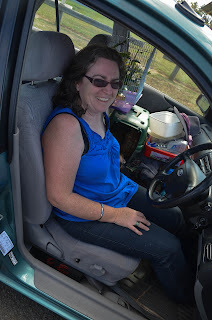 Although Erin initially drove the "menagerie car", I took over the driving just South of Sydney and remained in the driver's seat till the end of the day. Sundance aka Sunny (one of our cats) rode beside me with Lucy (Vaughan's stick insect) riding atop Sunny's cage. 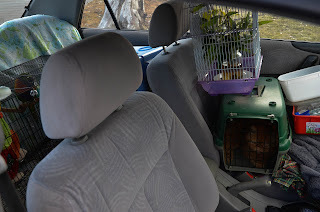 Our other cat, Oscar, shared the back seat with Keegan (Erin's rainbow lorikeet). Keegan often travels with us on our camping trips but long-distance driving was a new experience for the cats - and stick insect! Lucy didn't complain at all but Oscar and Sunny did at various stages! Overall they did well though - thankfully.